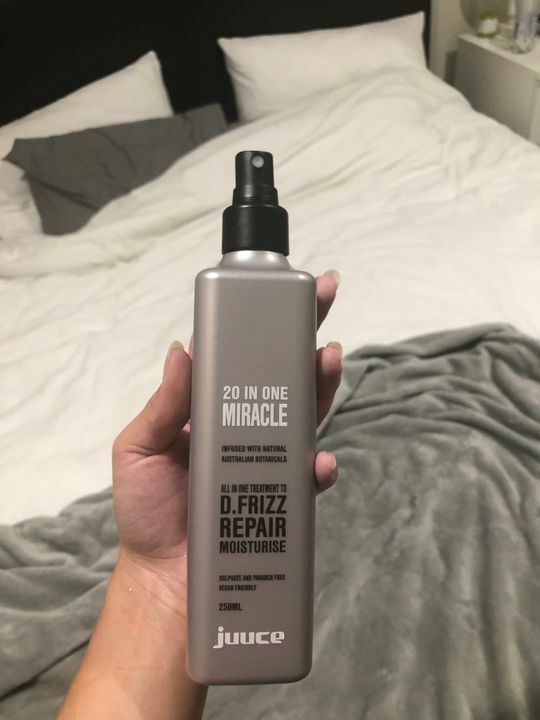 Juuce Miracle 20 in One with Moroccan Lava Clay and Australian Botanicals is a treatment spray that offers twenty instant benefits in one. Spray onto damp or dry hair. Helen W. Reviewed by Helen W.
I’m still trying to get a good balance with my hair. Sometimes I’ve applied too much and hair is very quickly flat and looks like it needs a wash. Other times not applied enough and my hair is very flyaway. Fantastic results! No more frizz! My hair grew back very curly and frizzy after having chemotherapy. I've been looking for a miracle product to help me control my brand new locks. Little did I know it really would be a miracle - 20 in ONE MIRACLE! It's been absolutely amazing! I'm so happy I can manage my hair now! This product actually works. Seals & de-frizzes the ends as promised. Makes my 'straw' look & feel healthy, it really IS a miracle. Nozzle does clog occasionally, but clears pretty quickly. Love this stuff.